Pagetoid reticulosis is an indolent cutaneous T-cell lymphoma and presents as erythema or plaque with a well-defined border on the distal areas of the extremities. Immunophenotypic studies show that in most cases, neoplastic lymphocytes are positive for CD4, whereas CD20 and CD30 double positivity was rarely reported. In this paper, we report an 80-year-old woman who presented with erythema on the extremities for 3 years. Skin biopsy on the right forearm was performed. 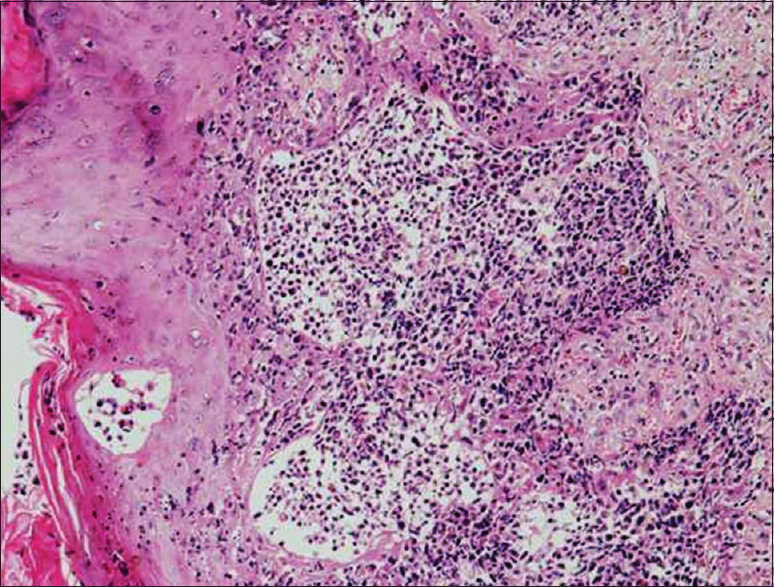 Histopathologically, the erythematous lesions were characterized by atypical lymphocytes with significant epidermotropism. Immunohistochemical staining showed high proliferation as evidenced by high Ki-67 index and that the tumor cells were positive for CD20 and CD30 but negative for CD7 and CD56. The patient was treated with one cycle of radiotherapy and is currently doing well. Pagetoid reticulosis (PR) is a rare variant of mycosis fungoides (MF). It was first discovered by Woringer and Kolopp in 1939, who reported a 13-year-old boy presenting with a solitary erythematous plaque on the forearm. PR has two forms: localized and disseminated. The localized variant is known as Woringer–Kolopp disease, while the disseminated variant is known as Ketron–Goodman disease. Notably, no variations were found between the two types in terms of morphology and immunohistochemical characteristics. However, the clinical manifestations vary. Woringer–Kolopp disease presents as an isolated erythema, whereas Ketron–Goodman disease presents with multiple erythema. Immunohistochemical studies showed that most cases of PR are negative for CD20 or not readily identified, and CD20 diffuse positivity has never been reported to date. In this paper, we report a patient with PR with strongly positive expression of CD20 and CD30 and discuss the clinicopathological characteristics of the disease. An 80-year-old woman presented to our institution with erythema on the extremities that gradually enlarged over 3 years. 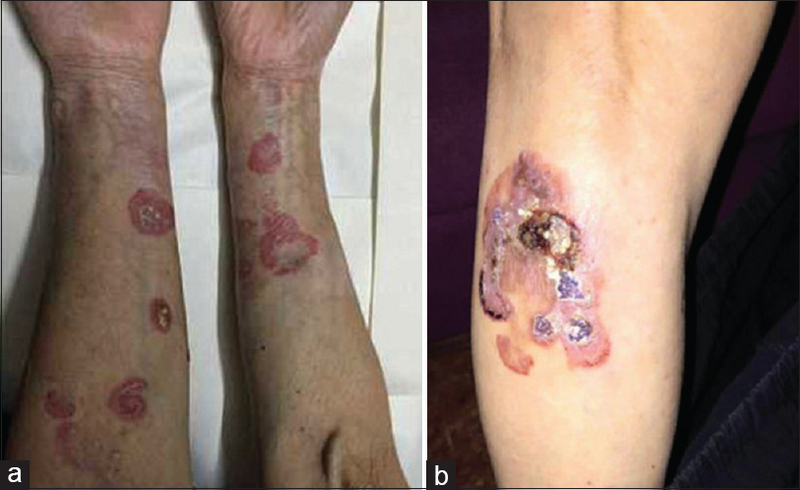 The lesions began to multiply, with markedly hyperkeratotic plaque and anabrosis developing on the distal areas of the extremities [Figure 1]a and [Figure 1]b. The patient was initially treated for dermatitis, but the lesions did not improve after treatment for a month. A skin biopsy on the right forearm was performed in our hospital. Macroscopically, the tumor was a 1.5 × 1.0 × 0.5-cm skin tissue and had a grayish cut surface without other changes. No necrosis and cystic change were noted. Microscopically, the lesion was characterized by epidermal hyperplasia with hyperkeratosis, parakeratosis, and acanthosis. The surface epithelium was infiltrated by atypical lymphocytes with abundant and pale eosinophilic cytoplasm, gyriform nuclei, and partially visible nucleoli. The lymphocytes were dispersed throughout the epidermis as single cells, two to three cells, or small nests [Figure 2]. The basement membrane was intact, and the superficial corium contained several mature lymphocytes and few atypical lymphocytes around the blood vessel. Immunohistochemically, the tumor cells stained positive for CD20 [Figure 3]a, CD30 [Figure 3]b, CD2, CD33, CD5, and CD4 [Figure 3]c, and negative for CD8, TIA-1, GrB, CD56, TCRαβ, TCRγδ, CD79α, PAX-5, Oct-2, and CD7. 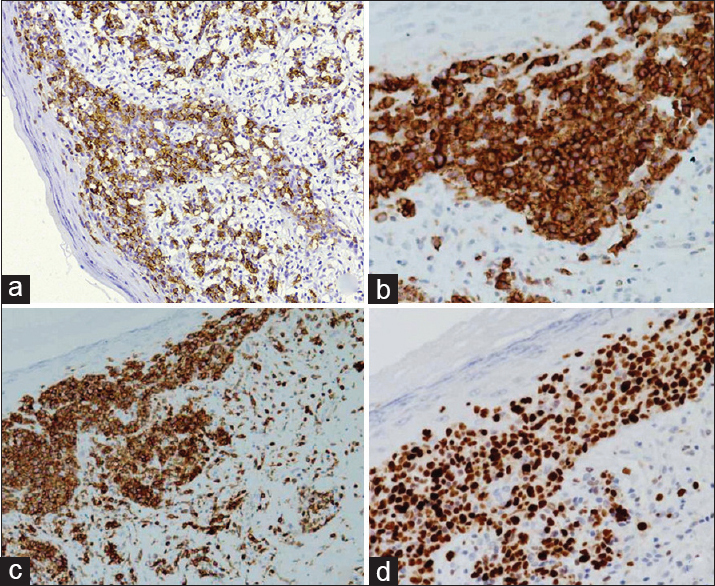 The Ki-67 proliferative index was over 50% [Figure 3]d.
Based on the results of histopathological and immunohistochemical studies, the patient was diagnosed with PR with high proliferative index. She was treated with one cycle of radiotherapy and is currently doing well. PR commonly develops among the middle-aged population and elderly men and affects men twice as often as women., It generally develops on the extremities but can also occur in various sites, including the face, axillae, and ventral abdomen. Clinically, it presents as a single psoriasiform or hyperkeratotic lesion with atypical lymphocyte infiltration, and the tumor cells have significant epidermotropism. Immunohistochemical tests are important for the diagnosis of lymphomas, including PR. Nearly, all cases of PR stain positive for CD3 and CD2 or with aberrant CD30 expression,, whereas that for the neoplastic T-cells vary (CD4+/CD8−, CD4−/CD8+, CD4−/CD8−). The Ki-67 proliferative index is relatively high in approximately 50%–60% of cases,, and the disease is generally negative for ALK, EMA, TIA-1, GrB, and CD56 expression. Meanwhile, few cases have been positive for CD20. These markers are commonly used for the differential diagnosis of PR from other spindle cell tumors, such as MF, Sézary syndrome, primary cutaneous anaplastic large-cell lymphoma, superficial spreading melanoma, Bowen disease, and extramammary Paget disease. The most remarkable feature of our case is that almost all the atypical lymphocytes were strongly stained positive for CD20. CD20 is a B-cell marker and is rarely expressed in T-cell tumors. CD20 immunoreactivity has never been reported in PR, and only one case in which CD20 was not readily identified was reported. In our case, the primary cutaneous epidermotropic lymphomas were positive for CD4 and negative for CD8. Furthermore, our patient had a solitary lesion with indolent biological behavior that slowly enlarged in over 3 years. The clinical features and the histopathological and immunohistochemical characteristics of the case were consistent with PR. At present, the treatment options for PR include electron beam radiation, pharmacological intervention, psoralen plus ultraviolet photochemotherapy, radiotherapy, and focal photodynamic therapy.,, Although the treatment effect is generally good, long-term observation after treatment is still necessary. In conclusion, PR is a rare variant of MF, and PR with dual positivity for CD20 and CD30 is exceedingly rare. Few cases have shown that a predominance of CD30+ cells is common in PR, but only one case has been reported to have >90% CD30 expression in the atypical lymphocytes. To the best of our knowledge, PR with diffuse CD20 positivity is rare. The clinical and histological features as well as the immunohistochemical phenotypes are helpful for the diagnosis of PR. Cribier B. History: Frederic Woringer (1903-1964) and Woringer-Kolopp disease. Am J Dermatopathol 2005;27:534-45. Morariu SH, Rotaru M, Vartolomei MD, Turcu M, Chiotoroiu AL, Suciu M, et al. Pagetoid reticulosis Woringer-Kolopp type, a particular variant of mycosis fungoides: A case report. Rom J Morphol Embryol 2014;55:1469-72. Martin SJ, Cohen PR, Cho-Vega JH, Tschen JA. CD8+ pagetoid reticulosis presenting as a solitary foot plaque in a young woman. J Clin Aesthet Dermatol 2010;3:46-9. Mendese GW, Beckford A, Krejci N, Mahalingam M, Goldberg L, Gilchrest BA. Pagetoid reticulosis in a prepubescent boy successfully treated with photodynamic therapy. Clin Exp Dermatol 2012;37:759-61. Hasbach AE, Stern AW. Pagetoid reticulosis (epitheliotropic cutaneous T-cell lymphoma) in an adult alpaca (Vicugna pacos). J Vet Diagn Invest 2016;28:469-72. Su O, Dizman D, Onsun N, Bahali AG, Biyik OD, Tosuner Z, et al. Treatment of localized pagetoid reticulosis with imiquimod: A case report and literature review. J Eur Acad Dermatol Venereol 2016;30:324-6. Ally MS, Robson A. A review of the solitary cutaneous T-cell lymphomas. J Cutan Pathol 2014;41:703-14. Mourtzinos N, Puri PK, Wang G, Liu ML. CD4/CD8 double negative pagetoid reticulosis: A case report and literature review. J Cutan Pathol 2010;37:491-6. Cho-Vega JH, Tschen JA, Duvic M, Vega F. Early-stage mycosis fungoides variants: Case-based review. Ann Diagn Pathol 2010;14:369-85. Jung SE, Kim YC. A case of pagetoid reticulosis treated with fractional laser-assisted photodynamic therapy. Clin Exp Dermatol 2015;40:468-70. Mercer SE, Vidal CI, Grummer SE, Strauchen JA, Gordon ML, Birge MB. Pagetoid reticulosis after radiotherapy of primary cutaneous anaplastic large-cell lymphoma. Am J Dermatopathol 2010;32:79-82.